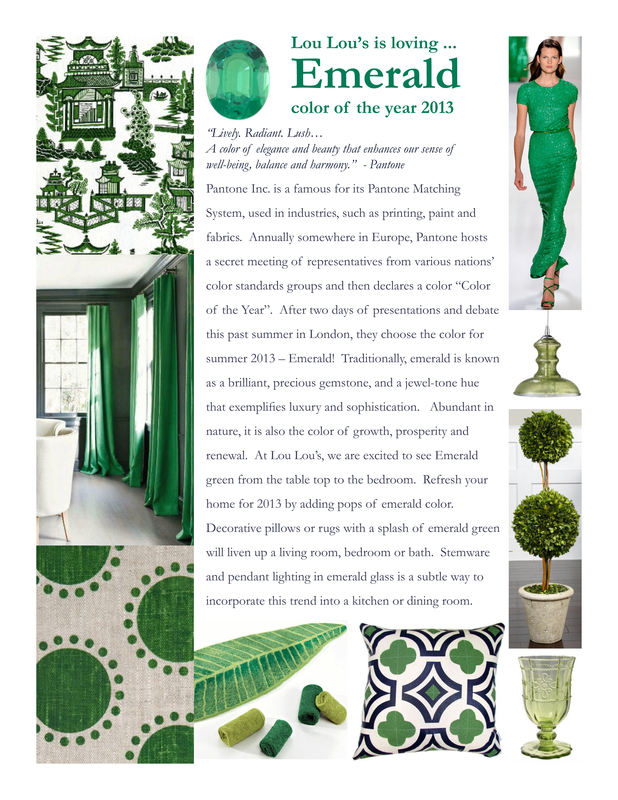 Lou Lou’s Decor is very proud to be featured in today’s blog for New England Home Magazine. 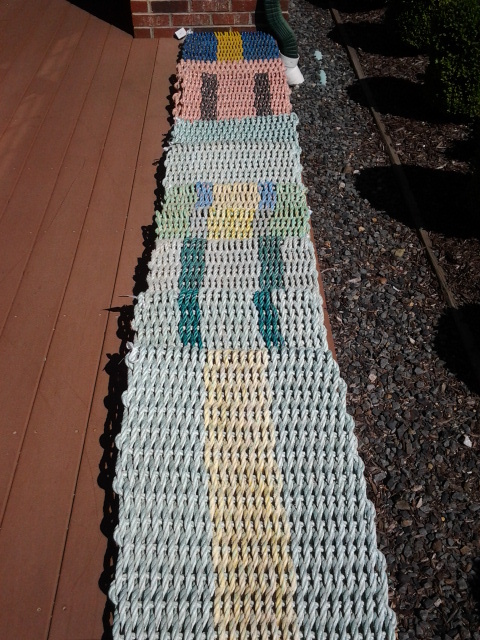 Authentically made in Maine, these Lobster Rope Door Mats are fun and colorful. They are a great way to accent the entry to your home in a light and bright way! 18″ x 30″ size. $55.00 each. 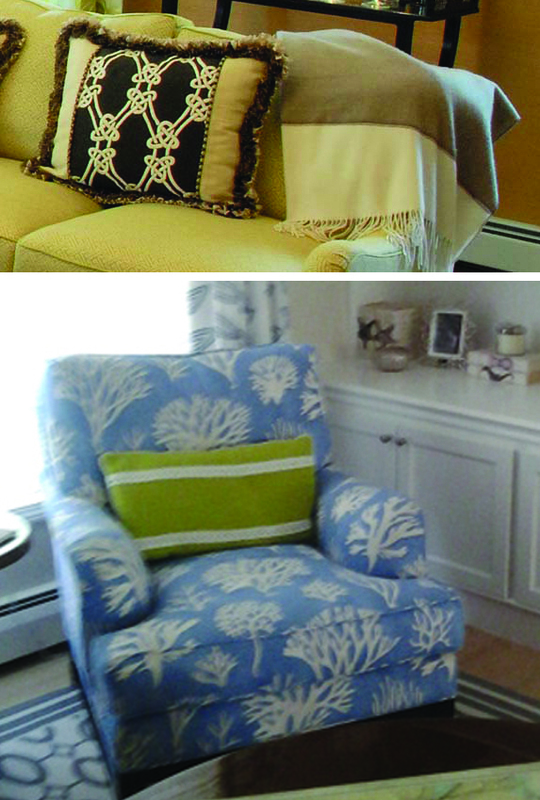 Toss on your sofa for a fresh spring look! 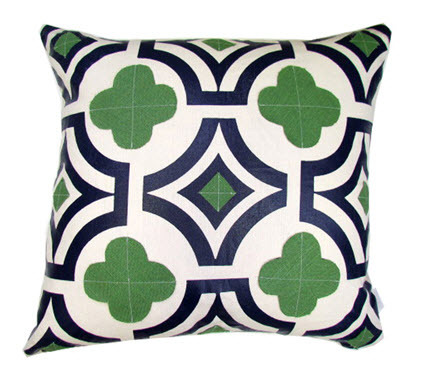 This green, white and navy clover applique pillow is the perfect spring update. 20″ x 20″ size. $158.00 each. 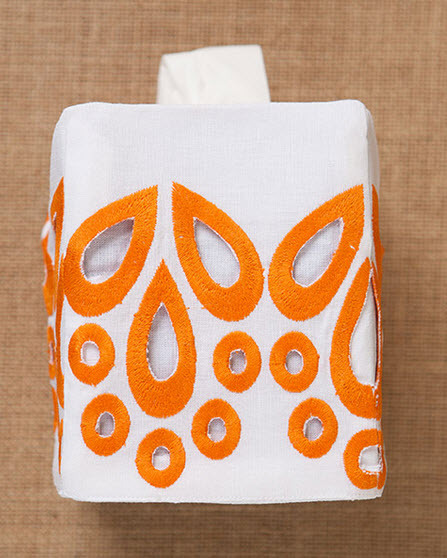 Add a pop of orange to your bathroom with these great embroidered accessories in white and orange! The cut outs add a unique detail. Prada Orange Tissue Box Cover $45.00 each. Prada Orange Tip Towel $39.00 each. Add some serenity to your home in the soft spring hues of these fabulous Lotus Tea Light Holders. They hold a standard tea light candle, are made of ceramic, and come in assorted colors. 5.5″ x 3″, $12.00 each. This crisp white napkin is embroidered with green and turquoise sea life motifs. It’s aquatic decor at its best! $37.00 each. 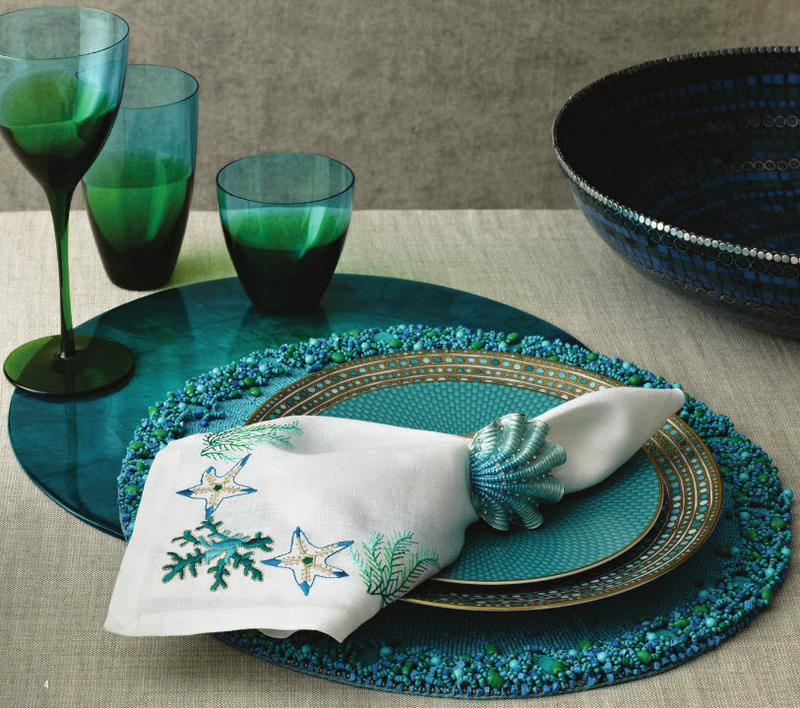 Bright and beaded, this Turquoise and Green Aquatic Placemat is a perfect accent for your table top! Make a bold spring statement at your next dinner party. $116.00 each. This gorgeous placemat comes in a beautiful azure color, among others. With these placemats, stains are a thing of the past. $68.00 each. Jewel tones pop in the cool colors of turquoise and green with this unique ombre glassware. Complete your spring tabletop with some bold colors! Double Old Fashioned $49.00 each. This mosaic bowl makes a beautiful center piece or serving piece for a coffee table or dining room table. Add some fresh fruit or a crisp salad and enjoy! $300. Make a beachy theme for your table top this spring with this Shell Napkin Ring. 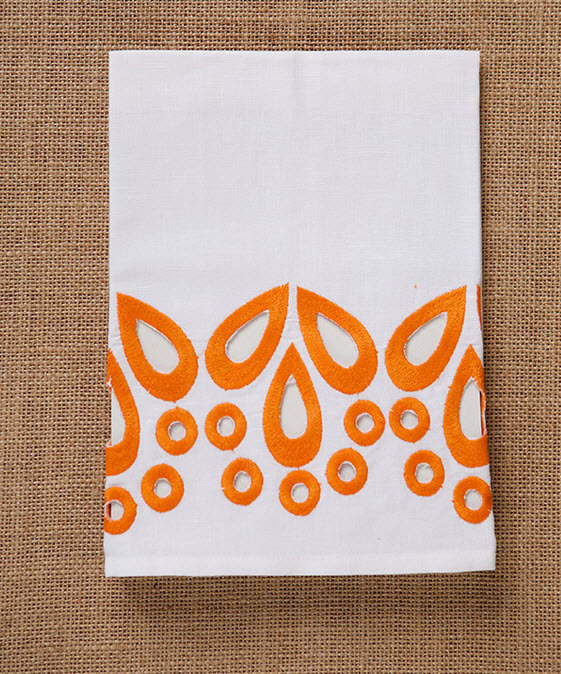 Inspired by the Ivory Coast, it adds color and complements a white napkin beautifully. $185.00 set of four. Attention to detail is what makes a good design great! 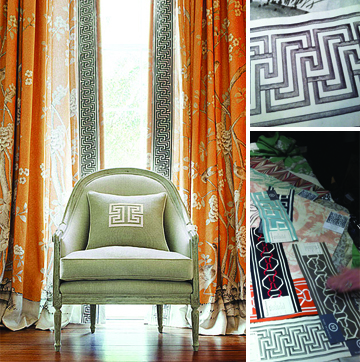 Through the use of decorative trims, you can customize a window treatment or decorative accessory to up the WOW factor! These embroidered tapes are brand new from one of our vendors! We cannot wait to use them on a project! The 6” width makes a bold and fabulous statement! These box cornices are finished off in a decorative trim to accent their shape! Show a fun and playful side with a tassle or pom pom trim on a lampshade or chandelier! Personalize your pillows with pop and pizzaz! 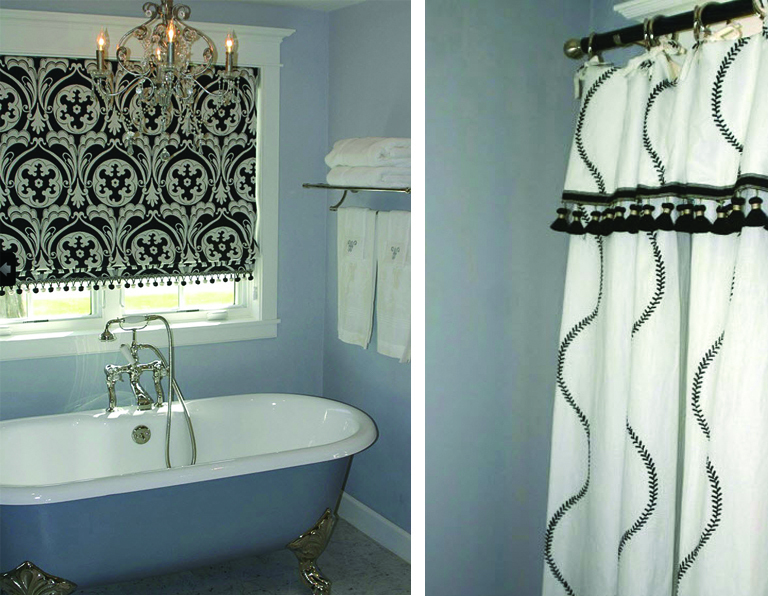 Create classic elegance in a bathroom with trim details on window treatments in black and white!